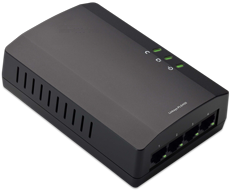 The PLS400 is a powerline device that has four (4) Ethernet ports. With these devices, you can create a powerline network. NOTE: A powerline network consists of at least two (2) powerline devices that operate on the same circuit breaker. It allows your computers and other wired devices to access the Internet. Standby/Reset Button – restores your powerline adapter to factory defaults. To do this, press and hold the Standby/Reset button for at least 10 seconds using a pin or a pointed object. HomePlug Simple Connect Button - configures the advanced security or network password for your powerline network.